Labor Day Favorite- Grilled Fish Tacos! In a bowl, combine the olive oil, garlic, chiles, and paprika with 1 teaspoon of black pepper. Put the snapper fillets in the bowl and rub with the marinade. Cover and refrigerate for at least 30 minutes, or up to 4 hours. In another large bowl, mix the green and red cabbage with the red onion. In a small bowl, mix the yogurt and mayonnaise. Pour over the cabbage and season with salt and pepper and toss. Cover the cole slaw with plastic wrap and refrigerate. In a food processor, puree the avocados with the lime juice. Blend in the sour cream. Scrape the avocado cream into a bowl and season with salt and pepper to taste. Light a grill. Season the snapper fillets with salt and pepper and grill the fish over a moderately hot fire for about 3 minutes per side, or until just cooked through. Transfer the fish to a platter, break the fish into large chunks, and cover loosely with foil. Wrap 3 stacks of 12 tortillas in foil and place on the grill until heated through (about 5 minutes). 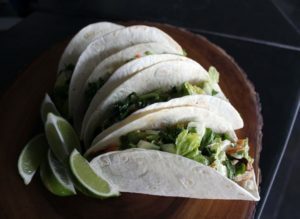 To assemble each taco, spread a dollop of avocado cream on a tortilla. Top with a piece of fish, a large spoonful of coleslaw and some cilantro leaves. Squeeze some lime and hit it with some hot sauce of your choice. We like Tapatio in this application. Enjoy!